There's a cliche you often hear tossed off by bad bosses, well-meaning encouragers and sarcastic douchebags. And it has become my #1 secret to spiritual and personal growth. As an example, I'll use my journey with drama. Now anyone that has ever met me knows I'm a dramatic individual. That's not what I'm talking about. What I'm talking about is either creating drama with others or engaging in the dramas others create or associating with drama junkies enough that you become a target of their drama. And let me be clear, all three—creator, participant and target—are equally addicted to drama. I know this because I've been all three and, from a place of somewhat recovery, I can tell you that they are all engaged in drama. And while some may claim they have no choice and they were dragged into it, blah, blah, blah, fact is they have a choice. And they choose to engage. And while others will craft holier-than-thou schemes to silence drama junkies as proof that they won't tolerate drama, they're not just engaging in the drama, they're creating and perpetuating it. In fact, anyone who claims to be a victim, imo, is engaging in drama. Those who claim their power, walk away and never look back are the ones who are not engaging. And if you're really over the drama, you won't even whisper about it in private. So to get from the place where you're creating/participating in/denying/fighting/being the target of drama to the place where you're not even whispering about it to your bff, you have to start faking it. Because, let's face it, it's hard to walk away from that crap, even if it doesn't involve you...and especially when it does. You either have a personal stake in it or it's like a car crash. You have to look. And as long as you keep indulging the personality traits that predispose you to drama—the need to be right, the need to be liked, the need to be included, the need to be in the know and the need to be heard and/or agreed with are biggies—you're not going to break free. So you have to fake it. When every fiber of your being wants to respond, you have to walk away and pretend that's not who you are anymore. And I say pretend, because clearly, that is still who you are or every fiber of your being wouldn't want to respond. So you might not feel genuine or true to yourself, because you're being true to the future you instead, while still having the same knee jerk responses of the old you. And each time you fake it, it gets easier. Until it gets real. And then your knee jerk response is to disengage and see drama for what it is now...someone else's problem—a problem that, if put on your radar, you will most assuredly end up regretting. So now I'm in a place where it's rare to get involved, in any active way, in group drama. Even if I'm the target of it. But, if I am indeed the target of it, I'll still whine about it in whispered conversations from time to time. And I'll also cop to offering opinions on controversial topics in places like Facebook (which is, by the way, getting involved in drama if you make more than one comment, imo.) But one of the "fake it until you make it" tricks I've learned there is to make my comment, then turn off notifications so you never know if someone agrees or not...so you don't continue the debate. I continued a debate last night, in fact. I wanted to be right. And when I recognized that, I turned off notifications. If your intention is have your opinion represented, then it shouldn't matter whether or not people agree. If you argue it, then you want to be right. A couple more things about letting go of drama—the further you remove yourself from the junkies, the more you see how little things, like telling others about the drama, is also drama. They are minor infractions, compared to the bigger picture, but each time you peel off a layer of an unwanted or worn out behavior, you encounter another layer hiding beneath that. Another thing is that, as you begin to remove layers of drama, you begin to analyze the things that continue to trigger you. For me, it's when someone attacks my integrity or lies about me. That's a trigger. Another trigger is wanting to be right. So in the example of the controversial Facebook discussion, turning off notifications helps me fake like I don't care if others think I'm right, until the day comes that I truly don't care. Once you see the triggers, you're likely to try to heal those things in some way, too. So trying to heal an attachment to drama actually becomes an impetus for healing other things in your life. But this isn't just about drama. 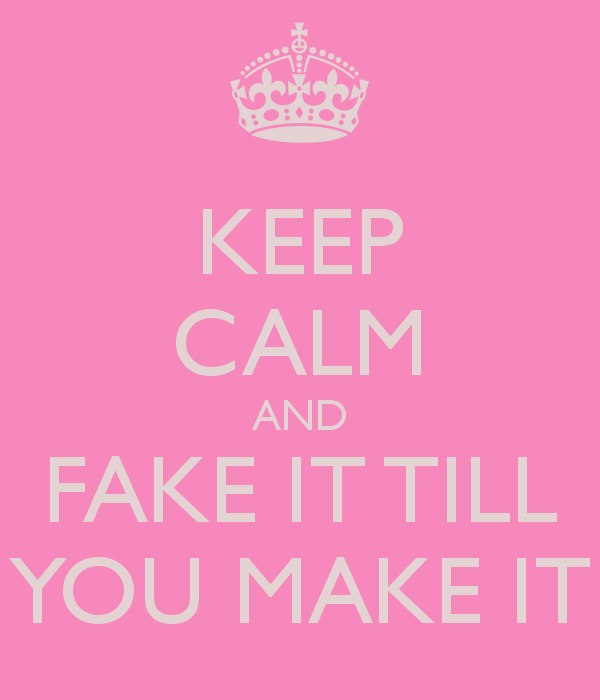 The "fake it until you make it" thing works on all sorts of behaviors you want to heal—gossip, pettiness and lack of compassion, to name a few. And it works on behaviors you want to adopt—kindness, compassion and understanding. And it works really well on overcoming fears you may have. 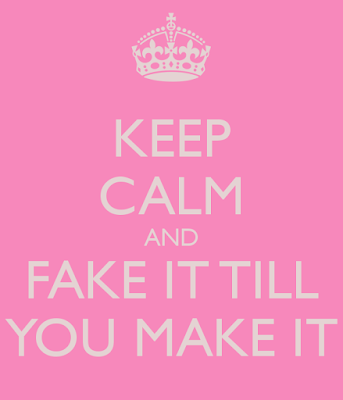 "Fake it until you make it" is like the ultimate spiritual multitool. You don't get out from underneath the toxic hold a behavior has on you the second you decide to change. Every thought and every action you make has a chemical signature that some part of you recognizes and relies upon. You may keep recreating a particular signature by habit or you may even become emotionally addicted to it. Healing an unhealthy behavior means plowing new chemical signatures that register as more desirable than the old. And that is a conscious process that happens over time, not a split-second event. It's also not a success-only journey. You're going to get sucked back in. And when you're "healed", you'll find new layers that need healing. And certain things will continue to trigger you. But if you keep faking it long enough, you'll turn around one day and see that you no longer want to be part of whatever behavior it was you wanted to change. And the desire to stay the heck away is very real. You will have faked your way to genuine change!